based on official Cuban data. Until 1989, Cuba’s State Committee on Statistics (CEE) published a series on the Global Social Product (GSP) based on the Soviet-style “material product system,” not comparable with the Gross Domes- tic Product (GDP) based on the Western “national accounts system.” A few Cuban scholars estimated GSP in 1990-93. The combination of these two sets of data show that GSP in constant (1981) prices suffered a cumulative decline of 45 percent in 1989-93 (CEE 1991; Carranza 1993; Carranza, Gutiérrez and Monreal 1995). A series of GDP (also in constant prices), published by the most popular Cuban maga- zine, indicated a decrease of 48 percent over the same period (Terrero 1994). In 1995 Cuba’s National Bank (BNC) released a different series on GDP at constant prices exhibiting a decline of only 35 per- cent over the same period (10 percentage points low- er than the decline in GSP and 13 points lower than in the previous GDP series). The Bank, nevertheless, revealed that the GDP decline in 1986-90 (during the anti-market “Rectification Process”) was 6.7 per- cent, more than twice the previously reported fall of 3.1 percent in GSP (CEE 1991; BNC 1995). 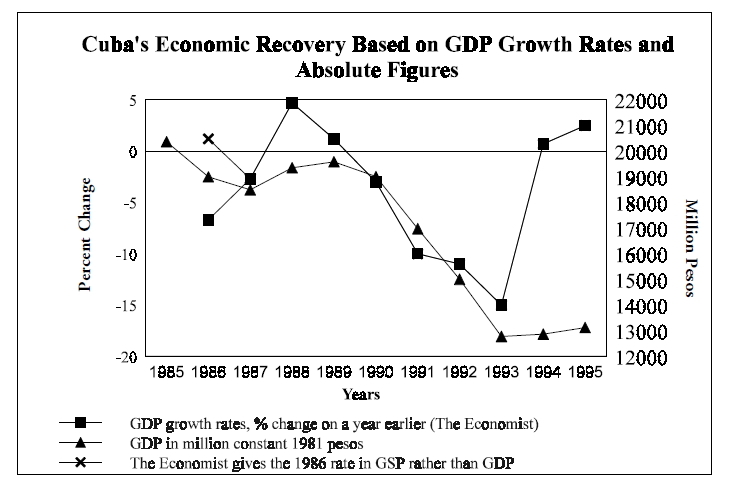 Be it deliberate or not, the reduction of the growth rate in 1986-89 resulted in a smaller decline of the rate in 1990-93. These changes and contradictions cast a doubt on the reliability of Cuban economic growth data, aggravated by the absolute absence of information on how the new GDP series is calculated, the deflator used, and so forth (Mesa-Lago 1997). The National Bank’s GDP official growth rate for 1994 was 0.7 percent, or 0.2 percent per capita (the population growth rate that year was only 0.5 per- cent due to the raft-exodus of 35,000 Cubans) and the Bank projected a 2 percent growth rate for 1995, but the Minister of Economics later reported a rate of 2.5 percent, or 1.6 percent per capita (BNC 1995; Rodríguez 1996a). These figures suggested that the four-year decline in the Cuban economy had been halted and a modest recovery had begun. The 1996 target was set at 5 percent, or 4.1 percent per capita, but in June the Minister of Economics reported a 7 percent growth rate for the first half of the year (Rodríguez 1996b). Less than a month later, Vice-President of the Council of State Carlos Lage raised that rate to 9.6 percent; he added, however, that such a high rate was the result of the increase in sugar out- put which was entirely credited to the first semester, and that growth in the second semester would be “smaller” but enough to fulfill the annual target rate of 5 percent (Lage 1996). A simple mathematical calculation reveals that to achieve an annual rate of 5 percent, the rate in the second semester would be only 0. 4 percent, or -0. 6 percent per capita. The stagnation/decline in the second semester could have two explanations: (a) the very high growth in the first semester makes more difficult a strong performance in the second (still this does not justify stagnation/decline, particularly in view of official re ports of recovery in part of the non-sugar sector); and (b) payment of loans taken by the Cubans to finance 1996 sugar output has reduced import capacity in the second half of the year (this point is developed in the next section). Even assuming that the Cuban economy indeed grows at an annual rate of 5 percent in 1996 (4 per- cent per capita) and that the Cuban economy is able to sustain such a rate in the future, it would take 9 years to recover the absolute GDP peak of 1985 or 14 years (until 2,009) to match the GDP per capita peak of 1985. The latter was 2,006 Cuban pesos. The official exchange rate of the peso for the U.S. dollar was par at the time (one peso for one U.S. dollar) but such rate was arbitrarily set by the government and did not reflect the real value of the peso in the domestic market (the peso is not traded in the world market). If the more realistic Cuban black-market exchange rate of 6 pesos per dollar prevailing in 1985 is used, Cuba’s GDP per capita that year was US$334 similar to that of Haiti (World Bank 1987). In September of 1996, the exchange rate in official exchange agencies was 20 pesos per one dollar; hence the projected GDP annual per capita of 1,228 pesos for 1996 was equivalent to US$61, the lowest in the world (World Bank 1996).The above projection of GDP per capita to the year 2009 was done in pesos; hence, the recovery of the 1985 level in dollar terms would depend on the market pe- so-dollar exchange rate in 2,009 remaining at the same level as in 1985. The official figure of sugar production in the 1995-96 harvest is 4.445 million tons (Lage 1996). This was 1.115 million tons more than the 3.3 mil- lion tons of the previous harvest (the lowest in 50 years). Domestic consumption in 1995 was reported as 800,000 tons (ECLAC 1995); assuming that a similar consumption occurs in 1996, the increase of sugar available for export would increase from 2.5 million tons in 1995 to 3.645 in 1996, for a net gain of 1.145 million tons. The sugar price in the world market averaged 13.28 U.S. cents in 1995, but fell to an average of 12.46 U.S. cents in the first eight months of 1996, with a tendency to decline. Based on those prices, the value of sugar exports in 1995 was US$730 million and would be about US$1,000 million in 1996, for a net export value increase of US$270 million. In order to increase sugar production in 1996, Cuba had to take substantial loans from foreign banks at a very high interest rate and repayable in one year. There are no accurate statistics on the amounts of those loans; published figures range from US$130 to $300 million, with a mid-point figure of US$228 million (The Economist 1996). The most quoted interest rate is 14 percent, but rates as high as 18 per- cent have been published. Based on loan values of US$228 million at an interest rate of 14 percent (US$32 million), the total to be paid back would be US$260 million, that is, a net gain of only US$10 million based in the US$270 million net increase in export value in 1995-96. In spite of the physical in- crease in sugar output, accounted in the GDP for the first semester of 1996, the net gain in hard currency revenue was very small and the payment of the loans will reduce Cuba’s capacity to import in the second semester of 1996. The reported oil shortages in September reflect that problem, and the cut in imports could then explain the stagnation/decline in the growth rate in the second semester. The lasting effects of the loans obtained to finance the sugar crop should be very small or nil because most of them were used to import fertilizers, herbicides, pesticides and fuel for the 1995-96 harvest, and those inputs will not have any effect on the next harvest. Part of the loan proceeds, nevertheless, was allocated to import spare parts for the sugar mills and should have more lasting effects; and yet the poor state of the Cuban mills is likely to provoke increasing break downs and need for spare parts. The long harvest of 1996 (there were mills still grinding in June) probably will have an adverse impact on the next crop, because unripe cane planted for 1996-97 was cut and the time for replanting and preparing for the next harvest was reduced (Lage 1996). Conversely, paying the loan should have a positive effect on Cuba’s credit ranking, but the Helms-Bur- ton Law seems to be playing a negative role. For in- stance, a Dutch bank that provided one of the 1995 loans to Cuba has announced that it will not do it again in 1996. In any case, to maintain sugar production at the same level as in 1995-96, Cuba would have to borrow a similar amount, with prospects of minimal gains and high risks (e.g., sugar world market prices may decline further, bad weather may harm the crop). Increasing sugar production over the 1995-96 level would require bigger loans and stakes would be higher. The first section of this essay made clear that Cuban macro statistics should be subject to careful scrutiny, while the second section showed that even unquestionable improvements in physical output, such as sugar, must be seriously analyzed to assess their net impact on growth. This author believes that the dramatic decline in the Cuban economy was halted in 1995-96, at least temporarily, but the recovery has been sluggish to say the least. Part of the problem is that the Cuban leadership has been reluctant and hesitant on market-oriented reforms and there have been setbacks as well as lack of an integrated, coherent reform package. Furthermore, the reform seems to have been halted or at least is proceeding at a very slow pace since mid-1995. Raúl Castro’s speech of March 1996 criticized both the adverse effects of the reforms and some institutions (e.g., the Center for the Study of the Americas, CEA) which had played a positive role in it. The speech prompted the demotion of, or admonition to, some scholars who had been leaders in the reform process and urged the government to accelerate and deepen it (CEA scholars have been prohibited to conduct research on Cuba’s domestic economy, unless doing so is necessary to tackle an international topic). “A Survey of Cuba,” The Economist (April 6, 1996), 16 pp. Banco Nacional de Cuba (BNC), Economic Report 1994. La Habana, August 1995. Carranza, Julio, “Cuba: los retos de la economía,” Cuadernos de Nuestra América, no. 19 (1993), pp. 131-159. Carranza, Julio, Luis Gutiérrez and Pedro Monreal, Cuba: la Restructuración de la Economía: Una Propuesta para el Debate. La Habana: Editorial de Ciencias Sociales, 1995. Castro, Raúl, “Informe del Buró Político sobre la situación política y social del país…,” Granma (March 27, 1996), pp. 2-6. Comité Estatal de Estadísticas (CEE), Anuario Estadístico de Cuba 1989. La Habana, 1991. Economic Commission for Latin America and the Caribbean (ECLAC), “Cuba: Evolución económica durante 1994,” Santiago, 1995. Lage, Carlos, “Informe del Ministerio de Economía y Planificación,” La Habana: EFE, July 23, 1996. Mesa-Lago, Carmelo, “Assessing Cuban Socio-Economic Statistics in the 1990s,” paper to be presented at the Meetings of the American Economic Association, ASCE Panel, New Orleans, January 1997. Rodríguez, José Luis, “Discurso en la V Feria Comercial del Caribe,” La Habana, June 30, 1996a. Rodríguez, José Luis. “Perspectivas Económicas de Cuba 1996.” Davos: World Economic Forum, February 1-6, 1996b. Terrero, Ariel, “Tendencias de un ajuste,” Bohemia (October 28, 1994). World Bank, World Development Report 1987 and 1996. New York: Oxford University Press, 1987, 1996.